Rooftop Reviews: Martin Luther King and "The Dream." Today is Martin Luther King's birthday. Although the holiday is still mired in controversy, it would be wrong not to note the occassion of his birth with a few words about the man, as well as a few words by the man himself. 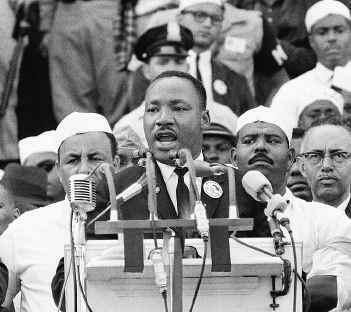 Few people in my lifetime have had as profound an affect upon a generation as did Martin Luther King. His personal lifestyle choices aside, this man put himself at great risk, and his family in grave danger, to achieve something lasting for his own people. His work within the system gave birth to some of the most sweeping legislation concerning Civil Rights in 100 years. This is a feat worth noting. Here is the text of the "I Have Dream Speech", which was delivered in August of 1963 on the steps of the Lincoln Memorial. The text is taken directly from the audio of the speech, which is viewable at the bottom of the page. I hope that, even if you have seen it before, you will watch it again. It is one of the greatest speeches ever made, in defense of any cause. Below is the video of the the speech. It's well worth watching and really listening to. It is as applicable today as it was in 1963.